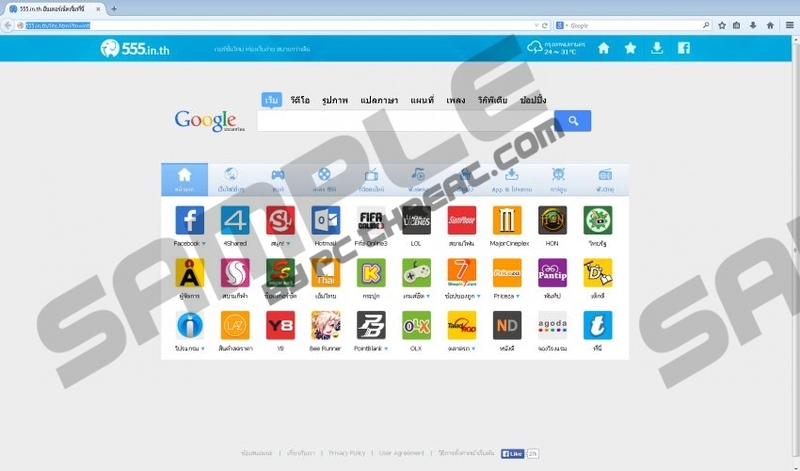 555.in.th is a search engine for Thailand-based computer users, and this search engine is promoted by a browser hijacker, which can be bundled with various freeware programs, mainly deceptive updates for various popular programs. It is crucial to pay close attention to the every page of the installation wizard so that undesirable programs and changes within the operating system can be prevented. Once installed, the browser hijacker changes the home page and default search provider to 555.in.th, which is powered by Google and some other popular websites. The browser hijacker promoting this search engine should be removed from the computer as soon as possible. The malicious program alters all the shortcuts of Internet Explorer, Google Chrome, and Mozilla Firefox by adding the URL hxxp://www.555.in.th/?tn=999_003 to the Target field of the shortcut. This modification is aimed at preventing you from changing the settings of the browsers. When you change the home of the browser and restart the browser, the same unwanted search provided is loaded. The fact that the browser hijacker uses such deceptive technique implies that the developers of the malicious program want you to use this program for as long as possible. The browser hijacker also creates it shortcut on the desktop. The shortcut opens one of the hijacked website. At first sight, it may seem that 555.in.th is a very useful search provider because the startup page contains many links to popular websites, which are categorized into groups, including games, music, shopping, and some others. Moreover, the search engine displays the temperature of the weather and enables you to access Facebook, Instagram, and Twitter with one click. Nevertheless, you should bear in mind that the malicious program promoting 555.in.th may be monitoring you. Information about you may be used for various purposes and even shared with third parties, which is one of the reasons why you should remove 555.in.th from the computer as soon as you can. As regards the removal of 555.in.th, we recommend that you implement a reputable security program. It is possible to remove the browser hijacker manually and fix the hijacked browsers, but it is much safer to rely on an anti-malware program because your computer needs protection against various malware and spyware programs. We recommend that you implement SpyHunter because this real-time security program can easily remove 555.in.th from the browsers and, most important, safeguard you against Trojan horses, ransomware infections, browser hijackers, adware programs, rootkits, fake security programs, and many other malicious programs. In case you are determined to remove 555.in.th manually, use the below-given instructions, but note that after you uninstall the 555.in.th browser hijacker, a folder of the program remains in the AppData directory. Quick & tested solution for 555.in.th removal.